Catholic News World : How to Bless your Home for Epiphany - CMB Chalk Blessing - SHARE - Christus Mansionem Benedicat - #Epiphany Easy Guide! 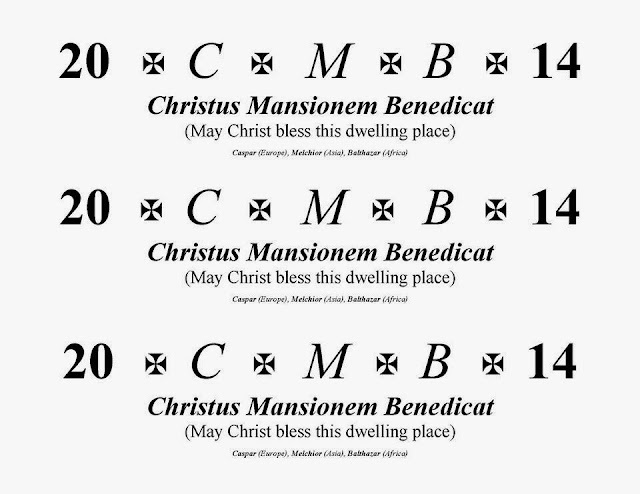 How to Bless your Home for Epiphany - CMB Chalk Blessing - SHARE - Christus Mansionem Benedicat - #Epiphany Easy Guide! Let us pray.Loving God, bless this chalk which you have created, that it may be helpful to your people; and grant that through the invocation of your most Holy Name that we who use it in faith to write upon the door of our home the names of your holy ones Caspar, Melchior, and Balthazar, may receive health of body and protection of soul for all who dwell in or visit our home; through Jesus Christ our Lord. Amen.